Ashley Barnes hopes his impact against Stoke City will help earn him a shot at former club Brighton on Saturday. Barnes – Sean Dyche’s first cash signing when he paid £450,000 in January 2014 from the Seagulls – came off the bench to down Stoke on Tuesday night. And his goal fired the Clarets into the Champions League places, for a night at least. The forward has made 13 substitute appearances so far this season, in the first 17 Premier League games, and it was his second goal of the campaign. But he understands the group ethic at Turf Moor, and was delighted to contribute: “Amazing isn’t it? That’s what you work hard for on the training ground and luckily enough it paid off,. “It’s a squad game and if I can help the team out in any way, then times like that, it makes me happy. “That’s what we’re waiting in the wings for. 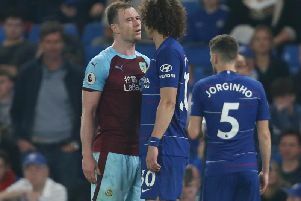 But while the fans can enjoy the giddy heights, and dream of a return to European competition after more than 50 years away, Burnley know they have to stay grounded and continue doing what they are doing. Tuesday was a grind in horrible weather, and Barnes added: “It was a terrible night. It wasn’t the most thrilling of games but luckily enough we came out on top. “It’s amazing. We’ll go and enjoy it and then we get back on the training field and work hard.